This morning I walked along the shore near my home, looking to spend some time on the beach conducting my own survey as part of the annual "Great Backyard Bird Count". I also wanted to see the beach in the brilliant sunshine. I knew the deep freeze this week would bring more fantastical ice sculptures where the lake's waves, whipped up by yesterday's terrific winds, would crash into the shore and splash up to the trees and rocks all along the edge. Sure enough, today was spectacularly beautiful. 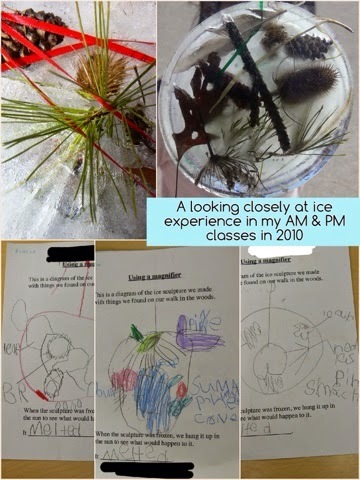 I've been thinking about writing a post about ice for some months now, but just as I think it's slowing down enough for me to sum up the wonderful winter explorations thus far, new sparks emerge and students take the #iceinquiry in a new direction. In fact, it's been about a year that I've been mulling over writing about ice as a material worthy of deep study. This has kept the post in draft form, as I tried to figure out when it was exactly that I fell in love with the ephemeral, unpredictable substance. My first thought was to look at my older photos, from the first years we moved out to Long Branch from our old downtown Toronto neighbourhood. Winter on the beach, bringing with it great rafts of winter ducks not seen until the snow flies, also brings unique scenes of beauty like the two below. Once I discovered that a windy day would dress the willows, or how gentle waves would form into an incredible variety of shapes at the water's edge, I couldn't wait for the temperature to drop each year. Imagine the sound of those icy willow branches, tinkling together in a light wind. Picture the water lapping up over the clear baubles, making the organic shapes disappear and reappear every few moments. It is a place of wonder. I noticed today that my first blog post was graced with an image from the beach, icicles reflecting off of the water that kept rising up to meet them. The end of 2013's dramatic ice storm likewise brought me out with my camera, carefully slipping along the sheer sidewalks and ever wary of the heavily-laden tree branches overhead, creaking and bending under the weight of several days' worth of freezing rain. It was frightening to travel in the neighbourhood right after the storm, but I couldn't resist the beauty of the world looking bejewelled. Back in the spring of 2010 I was teaching in an AM & PM Kindergarten in Brampton. At R.J. Lee we had a meandering creek in a tree-lined ravine, right next to our school grounds. I often took my classes for walks through the ravine path, and more often that not we gathered interesting natural materials along the way. Sometimes these leaves, pine cones, stones or other objects would become items in small world play or added to random loose parts in our nature area. I'm not sure what gave me the idea, but I suggested to the AM class that we create a sculpture out of our findings. We popped them all in a pie plate, wound ribbon through the middle, and put them in the freezer. The afternoon class, upon hearing about our project, asked if they could create one as well. I didn't know what we would do with them once frozen, but I was delighted by their initiative and so we also went for a gathering walk and made another sculpture. Here are some scenes from my classroom that week in March. I realize now that although I wasn't using the term "look closely", this was one of the first co-created projects that really invited students to look closely, make observations and predictions (about what would happen, which item would melt out first) and plan further investigations. I admit I had a laugh looking back when I saw the response page I created for students so that they would draw, label and write an observation (I didn't ask them for an observation in fact, but instead left a space for only one possible response: "melted"). In the intervening years my approach to teaching and learning has changed. I suppose my own learning about students has changed me each year, and I can't think of any time I wasn't adjusting my lessons, my routines, or my idea of what was meaningful to early learners. In any case, looking at these photos, I see I still expected each student to complete a response on paper. I invited them to capture what they saw before it melted away. I loved how some students captured the action, showing drips in their drawing, while others focused on the colours or shapes within. My way of framing the task (draw what you see, label) is still very much a practice in our class now, though it is a choice to participate. In this project, I was still the one making the decisions about what we learned and how it should be shared. I regret what was lost by not getting those students to talk about their own ideas and write a sentence based on their observations, their aha's, or their ideas for new projects. Seeing that flourish in our class this year, I wonder what might have happened if I had then asked: "So, what would you like to try to create next time? What do you think might happen?" I was taken with the interest and engagement of nearly every student. They were investigating the same materials which they had collected, but were now much more interesting simply because they were suspended in ice. So that weekend I made a sculpture at home with my daughter who'd just turned three. 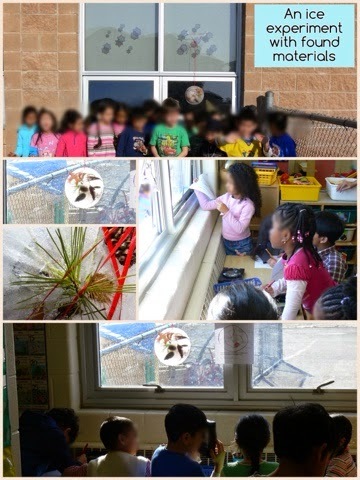 We used pampas grass, an insect gall, sumach and cedar, pine cones and needles. My girl was delighted and danced around the little garden, admiring the ice sculpture from many angles, even swinging it so it would "twang" against the metal rails. She caught drips on her hands, on leaves, and in her mouth. She asked for a stick so she could reach it from the walkway, and tried putting fallen items back into the sculpture when they dropped. She was showing me the way to true emergent curriculum, exploring with all her senses and not waiting to be told how or why or what. I saw how much more there was to see in a simple circle of ice. Recently, while visiting my parents up at my family home, I mentioned some of the ongoing ice projects in our class. My mom reminded me that my fascination with ice began long before I moved to Long Branch, long before I had my own children to dazzle with our beach's magical transformation in winter or little projects. At home where I grew up, we had a small but deep pond. Summers were spend swimming or dangling our feet off of a floating dock, inviting the many goldfish within to "nibble" at our toes. Winters we spent shoveling the pond clean of snow so we could skate. One year when I was young, my mom found a goldfish frozen in the ice. She cut a chunk out of the surface (my sister remembers her using an ax for the job) and brought the block of ice inside. We placed it in a large tank with cold water and waited. The fish thawed, began to swim, and became a family pet. That fish, "Saratoga" (so named by my sister who wanted to name it for the colour of the crayon "Sarasota Orange") became a family story much-shared with visitors who admired the tank or the pond. I also remember waiting for the pond to thaw each spring, and watching as the fish began to stir under the ice, showing through the thin sheet like glowing orange lights under glass. So with this fascination of mine for the ephemeral beauty and mystery of ice, I have used it as an invitation for learning often in the last few years. 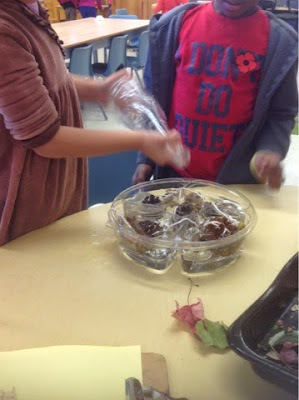 This year it started early in the fall during our explorations of various senses while learning about our bodies. 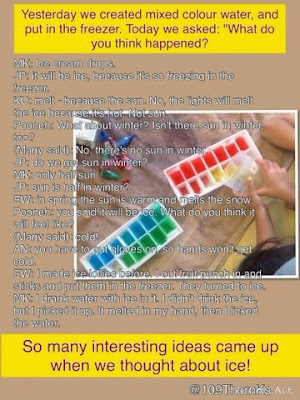 Pooneh made several trays full of ice cubes so that each student could have their own cubes to feel and explore. There was much squealing around our long banquet table as the ice melted, slipped off of plates, chilled fingers and cooled tongues. In November we had quite a lot of gathered materials from our outdoor explorations around the yard and around the school neighbourhood. I wondered aloud if anyone would like to use some of the 'tree gifts" to make an ice sculpture. GS and JE, both senior students who remembered the ice projects we'd done last year, jumped at the chance. I gave them the recycled vegetable tray and twine. GS asked for a bottle for water, and JE went about adding pine cones, bark and acorns. Another student added a dried apple we'd found under a nearby tree, and an oak leaf. GS estimated how much water she would need and cut the twine to her liking, and we popped it in the freezer. Thus began first hanging project of the year. Remembrance Day. GS creates her own ice project while ES looks on. The next day, we retrieved the ice sculpture and hung it near the window where we could watch it drip and spin in the light. GS helped to remove the sections from the tray, but then became interested in another project elsewhere and left me to suspend it over a tub. 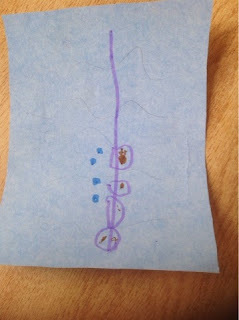 Students who hadn't noticed her create it yesterday were drawn to the sight of the ice chunks, all dangling in a line. 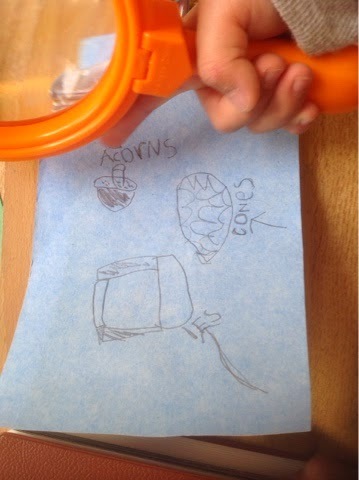 Clipboards and markers were brought over from the nearby "look closely" centre, and students began to draw what they saw. I was delighted by this spontaneous response. As the first few items fell, a game of prediction was born: "The pine cone is next", "No, this leaf is going to come out". One boy, RR, spend a long while collecting drips on his hands and on a magnifier, counting each one and guessing which ice chunk would release the next drip. The sculpture melted bit by bit over the morning, but we gathered it back into the tray, topped off with a little water, and returned it to the freezer before we headed outside to play. Many students visited the dripping sculpture over the morning. "The apple is cold". "This one is loose! It's going to fall next". 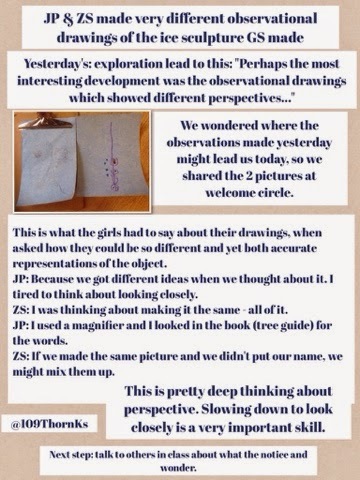 Most interesting to me was the way that two girls, ZS and JP, drew their observations. Looking at the same thing, they drew entirely different diagrams, each very detailed. I asked them if I could share their drawings with the class at the next day's welcome circle, so that I could highlight the way they both captured important details so distinctly. 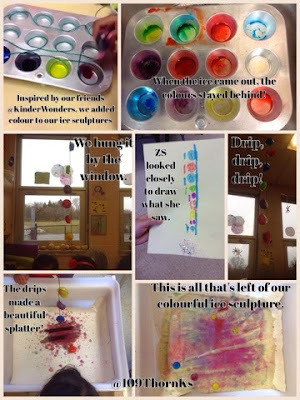 The conversation sparked many more students to examine the sculpture, hung in the window once again but dripping faster this time as the sun shone in the windows. Many more students added observational drawings to the collection which we wound up hanging on the wall to share with visitors. Below are the collages we shared with our families and followers on the class twitter. The drawings sparked an interesting conversation the next morning, about how we can look at the same things in the world but notice different aspects. It was our first real large discussion about perspective and ideas, a topic that continues to arise in the months since this day. It also sparked many more drawings by other students inspired to take a look at the ice and use their own perspective. To see the story as it was tweeted out that week, simply follow the thread from the first day. In the thread are images and vine videos of the process of creation, exploration, and reflection. Now at the same time that the hanging sculpture was generating interest in indoor ice projects, it was beginning to chill outside as well. That week we saw some snow flurries and found puddles which froze overnight. Many little projects sprung up, including a repeat project from last year, our "weather bottle" inquiry which was remembered by several students who were then juniors in our class. Those sparks led to interesting projects, but I'll save those for another post. 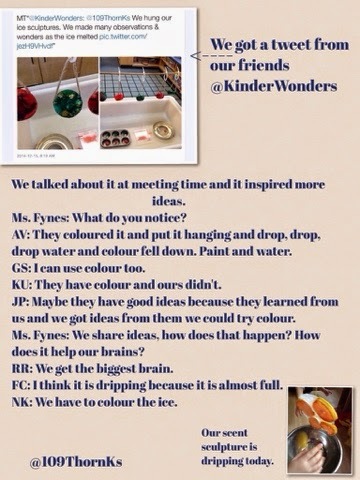 The next chapter in the hanging ice inquiry story began when we got a tweet from our friends in nearby Clarkson PS, @KinderWonders. 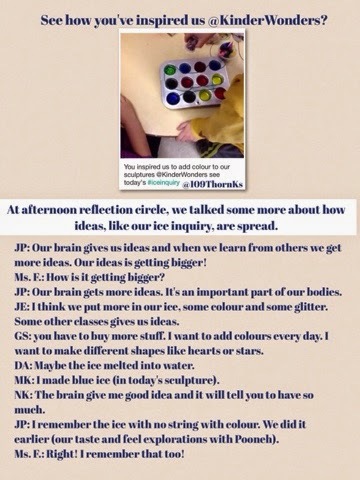 They had admired our story and used it as inspiration for their own ice project. I was delighted. Last year this same class had sparked a long-lasting collaborative inquiry between our two classes when they commented on a building project going on in our room. The critical thinking that became evident as students pored over the pictures coming in from the other class was astonishing, and worthy of a post of its own. So, wondering what might come of it, I showed my teaching partner Pooneh and we agreed to show the tweet (seen in the top corner of the collage, below) to the class. The collage shared what we managed to capture of a larger discussion. Our students were inspired and excited to try something new. 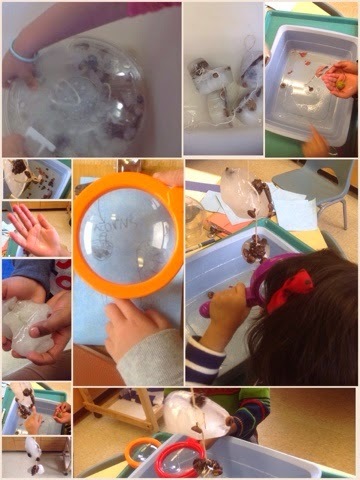 It is hard to capture the excitement that has developed out of this initial month of ice inquiry. Students have become aware of their own perspective when making observational drawings. They have begun to create elaborate plans, both in drawing and written form (prompted by Pooneh and I when we were overwhelmed by the requests for more and more materials and more space in the freezer). They make connections to earlier attempts and make increasingly more accurate predictions about the results of their personal or shared experiments. This is only the beginning of our ice inquiries this year. More will follow in part 2.